The gloves are intended for light work duty and mosquito protection. They may be worn alone, or for additional warmth under cold conditions, may be worn with the wool inserts. 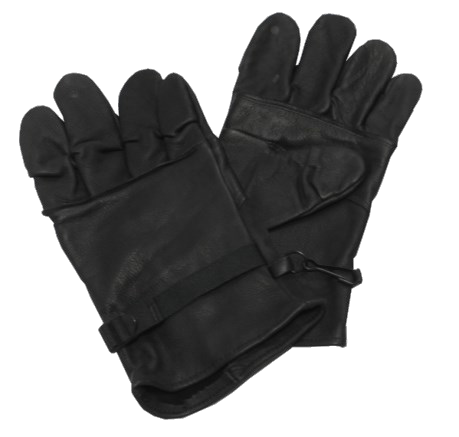 The gloves are also intended for wear over chemical protective handwear covered by MIL-G-43796. The glove shall be made of full grain, chrome tanned cattlehide conforming to type I, class a or b, treatment A of MIL-L-40051 except that the thickness shall be such as to produce finished gloves with a leather thickness not less than 2 ounces nor more than 3 ounces. The leather shall be treated with an approved water resistant treatment, which consists of the co-application of an emulsified fluorocarbon and a modified melamine hydrophobe type of resistant. The color of the leather shall be black. The gloves conform to Rinehart Glove Ltd. style Flexor 2000 or equal. The gloves shall be unlined leather, wing thumb, inseam sewn, with a buckle strap closure on the back of the wrist and a snaphook and D-ring system at the gauntlet for attaching the gloves to each other.